What is Combat Tai Chi? When we say Combat Tai Chi we are actually referring to Tai Chi Chuan. Chuan means Fist. All Tai Chi started out as Combat Tai Chi or Tai Chi Chuan. We tend to say Combat Tai Chi rather than just Tai Chi because although the direct translation is fist in the case of Combat Tai Chi fist refers to the idea of combative use much more than any specific reference to an actual fist. Over the last 50 years or so some Tai Chi instructors dropped the Martial Tai Chi fighting principles from their art and started calling their art just Tai Chi without the Chuan. The idea was to allow practitioners to learn and work on the health and healing while leaving out the martial aspects of Combat Tai Chi. The problem is that the Combat Tai Chi moves/forms have specific internal and external applications that are also the correct uses for health and healing with Tai Chi. Without these applications the art truly is not Combat Tai Chi and it is not able to impart the amazing internally healthy Tai Chi benefits either because the mechanical and energetic principles are not understood and so are not being worked in the movements. 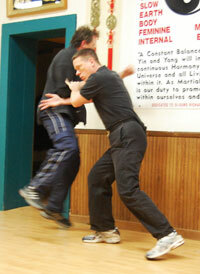 Combat Tai Chi involves all aspects of self defense with Tai Chi. 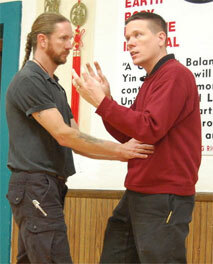 Combat Tai Chi also includes the healing aspects. 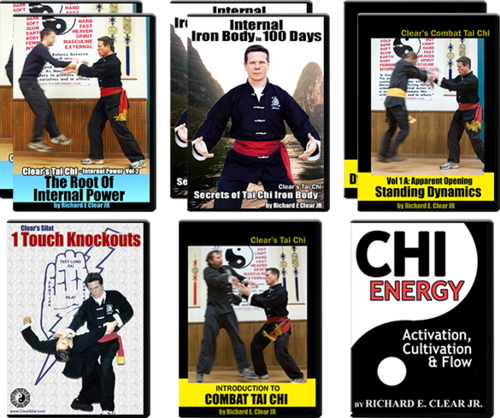 However, when we say Combat Tai Chi on our videos and materials we tend to just put the Martial aspects of the Tai Chi on that DVD or video. So, the student who wants Combat Tai Chi can specifically obtain and work on that. If the student wants the health aspects of Tai Chi then they can study that aspect by itself also. However, in our regular curriculum you will find the health and healing is mixed right in with the self defense and it is very easy to see that Combat Tai Chi and Tai Chi are one and the same. So, the point I am making here is that although Combat Tai Chi and Tai Chi for health can be studied separately they must be studied together at least to some degree in order for the student to really understand the material. Clear’s Combat Tai Chi program will teach you to fight with Tai Chi quickly and effectively. You will learn Tai Chi principles & techniques that can be used right away for immediate self defense, and you will develop the high level internal combat skills of Tai Chi like: Fa Jing, advanced Dim Mak, Internal Iron Body and much more. 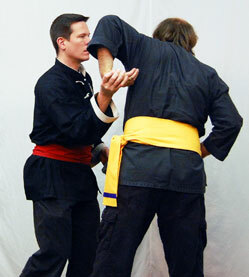 Learn to defeat and negate Dim Mak strikes and bone breaks. Learn how to combine and apply all these skills & many more in real street self defense situations. Is tai chi really a combat art or health dance we simply don’t know . That is a question pls. Answer . It is both health and combat at the same time. To try and separate them is to diminish both. Separating them is called Tai Cheese. I don´t speak english very well, have you any materials in spanish language? Thanks for your answer. No, unfortunately we only have videos in English at this time. Hermano..try to use your translator as much as possible. I live on the island of Maui, Hawaii. I have been iterested in combat Tai Chi for many years but can find no local instructors. In attempts to study on my own ( as there is no “complete” Tai Chi instruction ie; combat/martial applications/forms as well as health) l have realized my need for an instructor and the presence of a master in order to gain real knowledge and skill. At 58 yrs old l am dealing with aging and some health issues including arthritic conditions and am tired of western medecine’s depency on drugs and surgery. They have only led me to a very bad place. The question l have is this. Are there any viable instructors of complete Combat Tai Chi in my area? If there are please may l be put in touch with them. to try some of the simpler things l have practiced at length and felt confident in ie; brush knee and twist, parting the horses mane. White Crane spreads wings. I am quite sure l am still missing on several points…! Anyway… I hope there is some hope! Got any instructors/masters that want to move to Maui? I am a producer of music as well. My partner ( a mixed martial artist who l am trying to tslk into playing push hands… Your videos should help there!) and l produce music for video, commercials, games, movies, hip hop artists, intro music for pro mma fighters, etc. etc. If you ever require or think you might require such services kindly let us know! Mahalo Nui Loa! A hui ho!!! Our distance learning program is available in DVD format, and we have even more material being put on our member site. The program was designed to be learned effectively in these formats. Sigung Clear has sought out high-level training from a variety of accomplished Grand Masters, and the training we offer is truly unique. There are very few people who are qualified to teach our program, so finding a live instructor in your area probably won’t help you. If you are looking for additional in-person instruction, I would recommend you visit us for a workshop or private lesson. If you have a group of interested players, you could arrange to host us for one in Maui. This is a distance program, but it never hurts to get a live “tune-up” from Sigung Clear, and even one workshop will help you to jump start your training. Hi Jim, Thank you. Glad you enjoy or stuff. Yeah, it’s unfortunate that many folks don’t teach as openly as they could. Everyone would benefit if more teachers would share completely and openly. For the stuff you’re interested in I highly recommend starting with our Internal Iron Palm video. This builds the foundation of vibrating palm. …and start working our Internal Push Hands method as this will give you the training method for many of the advanced palms and how to direct the power of your strikes to specific targets inside your opponent. The Internal Iron package is a great way to learn this and includes a whole bunch of related skills that will enhance and amplify what you’re doing with the Internal Iron Palm training and push hands. We have a complete curriculum in Tai Chi, from rank beginner to Master. So in other words, Yes! 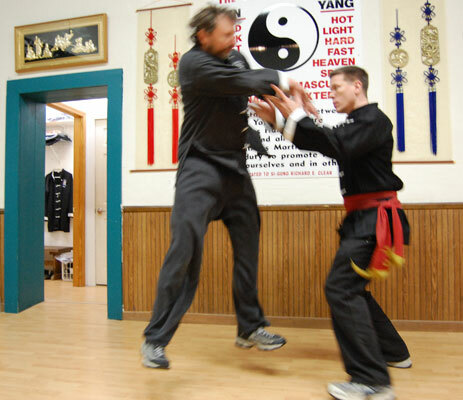 The weapons training rapidly imparts many sought-after Tai Chi skills at the higher levels of the training. Hi, I just have a couple questions about your Combat Tai Chi system. Does it have any body conditioning methods as well? And also, what’s the difference between your DVD’s on this system and the one that is on the TRS website? 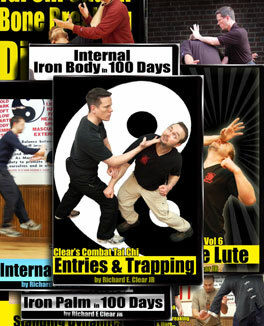 Click here to check out our selection of Combat Tai Chi DVDs"
Clear's Combat Tai Chi program will teach you to fight with Tai Chi quickly and effectively. Using a combination of "quick and dirty" street apps as well as in depth instruction in internal skills like Fa Jing, Dim Mak, "Steel Wrapped in Cotton" and more.